The new crop of tubeless gravel class tires require sealant inside. here’s our take on a couple we’ve tested. 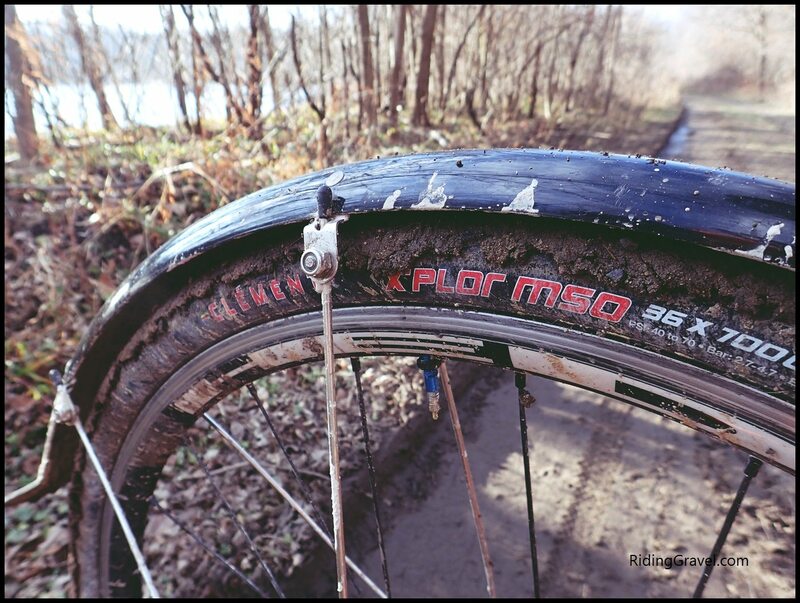 Caffe Latex was used in the recently tested Clement MSO 36mm tires. The Caffe Latex sealant spent its time inside our recently tested Clement MSO 36mm tires. The sealant performed well in a day to day sense. Tire pressures were consistent in that they would drop over a period of days, but not out of the ordinary. Over the three plus month testing period the pressures remained predictable and consistent until the very end when the rear tire exhibited a tendency to lose pressure more rapidly. This usually is an indication of a dried out condition, and when I peeled back the tire to inspect it recently, I found that both tires had sealant which had completely dried up. Caffe Latex says that there sealant has a service life of “up to 12 months depending upon circumstances”. Obviously in my testing it fell well short of that mark, but well within what I have experienced with other similar sealants. By the way, Caffe Latex does say you should check the sealant “every two months” to ensure it hasn’t dried up. I would recommend that as well. The puncture sealing capabilities of any sealant are probably what most people are concerned with, and Caffe Latex proved out to be a good performer in that regard. I will give a specific instance of this performance below, but for now I can say that it seals so fast that in the transition from taking off my compressor hose to installing the removable valve core while setting up the tires, the sealant was coagulating in the valve stem, which is a pretty big hole when you think about it. Incidentally, I did not have trouble installing both valve cores and they both function well. The dried out Caffe Latex. It is easy to see that Caffe Latex rides up against the inside of the casing, where you need it. There was no residue on the rim, by the way. At The Finish: Caffe Latex is a good sealant in a day to day sense and seals punctures well if you have wet sealant in the tires when you get a puncture. It is hard to predict when a sealant will no longer be effective at sealing your tires, but given that most latex based sealants usually have a three to four month effective lifespan, it might be prudent to recharge a Caffe Latex injected tire within that span instead of relying on the company’s outlandish 12 month claim. 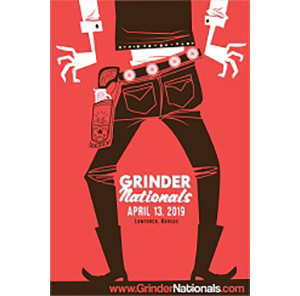 The good news is that Caffe Latex can be injected right past your valve stem- no need to remove the core, and comes in a handy, single application pouch which you could pack along with you if need be. Finally, the companion product, ZOT! Nano, which we detailed in a post here, can be used for severe cuts and larger punctures, a feature no other sealant we know of has available. Caffe Latex is a good sealant that works when you need it to, has a companion product which helps seal bigger, more severe cuts and punctures, and is easily recharged by injection past your valve stem when need be. One thing to note here is that Caffe Latex is ammonia free and is very tire and rim friendly. Caffe Latex does last as long as many other latex based sealants I’ve tried and if you keep that in mind, Caffe Latex is a good choice for the inside of your tubeless tire choice. 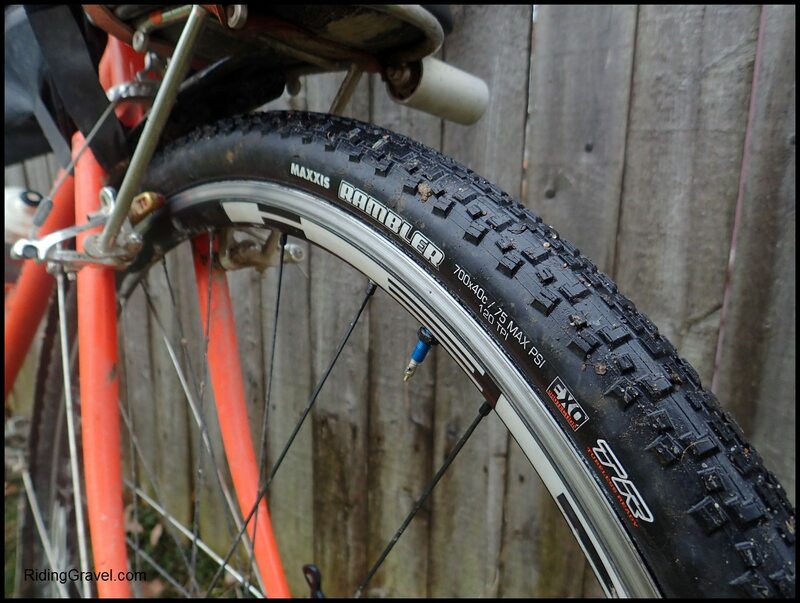 __________________________________________________________________________________ Velowurks: The Velowurks sealant spent time in the Maxxis Rambler 40mm tires we are finishing up testing now, and also in one of my commuter bikes, a Surly 1X1. The conditions the sealant was used in match what I did with the Caffe Latex sealant, and the Surly saw a bit more Winter, low temperature usage, since Velowurks claims its sealant works at well below freezing. Velowurks sealant after the test period showing how it separated out into liquid and latex film. 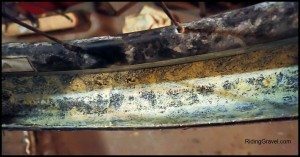 Velowurks claims a sealant service life of up to six months, and while the sealant was still in a wet state when checked at the end of the test period, it was separated. Velowurks has a component of latex in it which was strung out and coagulated, mostly against the inner casing of the tire, but not consistently so. There were also several completely bare patches of tire casing observed. In day to day living with the sealant, I experienced a mixed bag of results. For example; the rear tire of the Surly always consistently went soft at a faster rate than did the front tire, and a similar situation was observed with the Maxxis tires the sealant was tested in. This could have been a result of two tires with other leakage issues, but I am inclined to think it has something to do with this sealant’s performance. In the case of puncture protection, I have some concerns regarding the Velowurks product. Shortly after installing it according to label instructions in the Maxxis Rambler tires, I experienced a front tire puncture. It was a small enough puncture that sealant was being atomized as it sprayed out of the front tire. I slowed and placed the puncture at the bottom, so gravity would feed sealant to the puncture site. It seemed to seal up within about 20 seconds, and I pumped the tire back up to pressure. After rolling about three feet, the sealant began to spew again, and I repeated the same procedure. Again, after rolling a short distance, the tire started to leak again. This time I realized that so much sealant had been expelled that I could not get the tire to seal up again, and I had to resort to using a tube I had along with me. Caffe Latex sealed up the same puncture within seconds and with minimal pressure loss. I contacted my Velowurks representative and after they conferred on their end it was determined that I should use the sealant after shaking the container it was sent to me in vigorously as the micro-particles that help coagulate the sealant may have been settled out of the mixture. Now, keeping in mind that I did shake the container for the requested one minute when I first used the sealant, this seemed rather strange to me. It also raised concerns about how the micro-particles might settle out after sitting in a tire for a time. Seeing how the latex component separated and dried out from the rest of the mixture after the test period also causes me concerns about the effectiveness of this sealant when thinking about how it would work sealing punctures. After the incident, I did use the sealant, shaking it up even longer this time, but it never really ever seemed to work like you might think it should. Sealant weeped from the puncture site continuously, and I never could get it to stop. Eventually, when the sealant test period was over, I cleaned out the Velowurks, installed Caffe Latex, and mounted the tire on a different rim. The sealant spewed from the same site but sealed the hole in well under ten seconds with a 5psi drop in pressure. At The Finish: I never did get a satisfactory solution to my issues with Velowurks sealant, and while it did stay liquefied throughout the three plus month testing period, I am skeptical about the effectiveness of its puncture protection for several reasons. I am impressed by the claims of sub-freezing performance, but even my cool, Fall day experience with a small puncture seemed to indicate that there are issues with this sealant working as advertised. I see potential in the Velowurks product, but until the issues I experienced are rectified, I cannot recommend this sealant as something you should use in your tubeless tires. Note: Cantitoe Road and Velowurks sent over these products for test/review at no charge to Riding Gravel. We are not being paid nor bribed for these reviews and we will strive to give our honest thoughts and opinions throughout.